The day of the wedding started out gloomy and cloudy with unseasonably cooler temperatures, a twist from what we are used to in July in Iowa. By noon, the sun was shining and the breeze rustled the leaves on the trees with the temperatures still only rising to a comfortable mid-80s. For a couple who lives in Pheonix, Arizona, I’m sure it felt great. 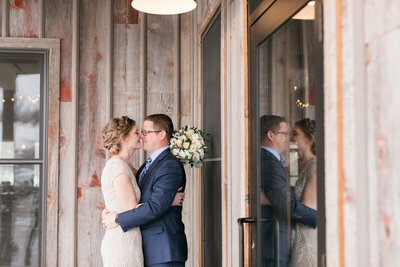 When we arrived at the Celebration Farm barns, the centerpieces were being arranged, the bridesmaids were snacking on lunch, and the general hustle of a wedding day was just started to pick up pace. Just a few quick hours later, Eva & Aaron pledged their faithfulness, love, and friendship to each other for the rest of their lives. Their ceremony was filled with their overflowing love of Jesus and centered completely on Him. Since Eva’s family attend the same church as us, I knew many of the people there, which is always fun. And finally that day arrived! Eva & Aaron, I’m so honored to have witnessed the start of your marriage and I wish you all the best as you start this beautiful journey together! Eva recorded a video message for her dad before their first look. Her sisters, Rachael & Mary, played it for him and there were tears all around. Meanwhile, Aaron was finishing getting ready to see his bride for the first time that day. Their joy was absolutely contagious! After dinner, we snuck back out for a few more minutes of portraits and they were absolutely breathtaking! We had a trifecta of elements working against us, all of them out of our control: downtown Jazz Fest traffic, construction road closures (including a major bridge between the ceremony and reception venues), and intense heat & summer humidity. 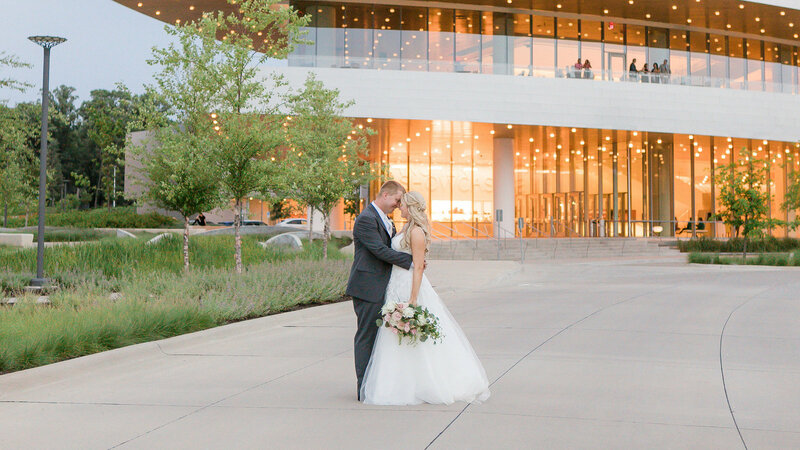 But I promised Brooke you wouldn’t see any cranes in the background of her wedding images at Hancher and the spot that I picked for their downtown images was easy enough to shoot around the pedestrians. The heat? Well, we worked fast. At one point, Brandon asked if there was any way to get out of those outdoor photos and I promised him that I would be faster than he imagined. And I think I surprised all of the guys with how quickly I got them back into the air-conditioning. I hope that looking back on the day, no one remembers the heat or the uncomfortable shoes or the tight timeline to get everything done. I hope all you see is the beauty of a perfect day for the beginning of a marriage. Brooke and Brandon have been a joy to work with; both filled with such fun and laughter and Brandon especially cracking jokes from start to end. When Brooke describes Brandon, she says she admires “how hard of a worker he is and how he can just befriend everyone he talks to.” She also said that he is positive, energetic, and dedicated. 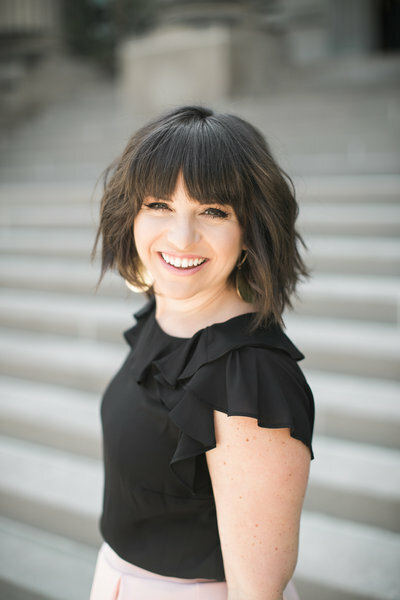 He said he admires “her drive towards being a teacher and helping kids learn” and that she is caring, loving, fun and adventurous, and persistent. In the short time I got to know them both, I would complete agree! 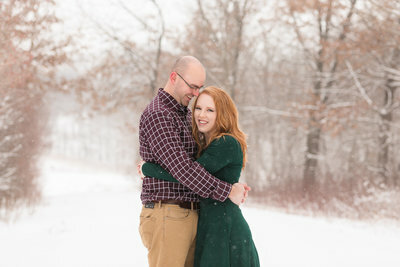 Back before their engagement session, I had asked them both what they looked forward to most about their wedding day. 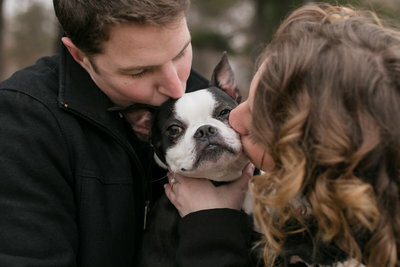 Brooke said, “I’m looking forward to celebrating with all of our closest friends and family. Also, I’m excited to get to start our new life together and become Mrs. Smalley!” Brandon added that he was also excited to be “celebrating with friends and family about finding the perfect partner and combining our lives together for the best future!” And truly, it was such a joyous celebration that I believe their wishes came true. 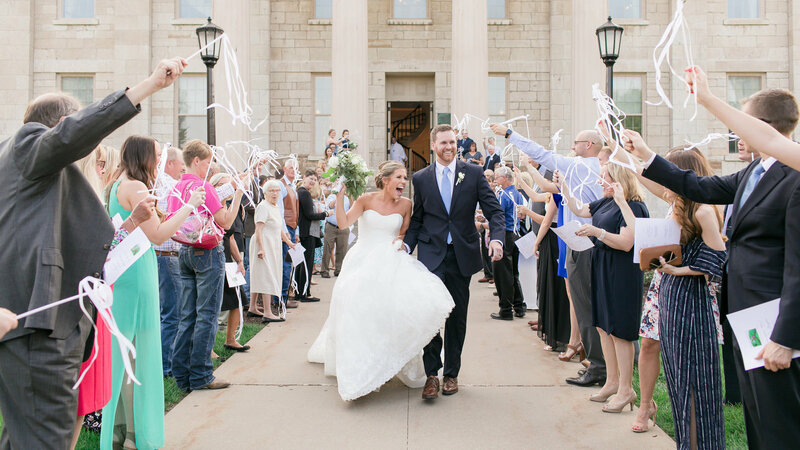 Brooke & Brandon chose not to see each other before the wedding, but they did want to exchange letters so they did a “first touch” outside the church. It was a tender moment that had them both in happy tears. The u-shape of First United Methodist Church lends itself to the most beautiful photos. It also provides really great access to photograph different perspectives fairly unobtrusively. My absolute favorite thing about these exit photos–which I didn’t even notice until I was editing them later–is both of Brooke’s grandmas beaming at them as they came out of the church. Brooke was living her Cinderella dream all day. She looked like a princess. You’d laugh if you knew the struggle we had with this stunning veil. I love long veils and they are usually so easy to photograph, but the wind was working against us so much during all of these pictures. I was determined to get at least ONE photo showcasing her gorgeous veil–and I did–but we had to work pretty hard to get it! This cake was just as delicious as it looks. I joked that I chose my profession based on the cake, but, really, it is an excellent perk of the job. It was getting dark quickly, but we ran back outside to grab some evening photos (the sun had already dipped so we missed “sunset”, but just look at these and you’ll know why I’m not even a little mad about it)! It was the weekend before July 4th and Brooke and Brandon decided to surprise their guests with a fireworks show! 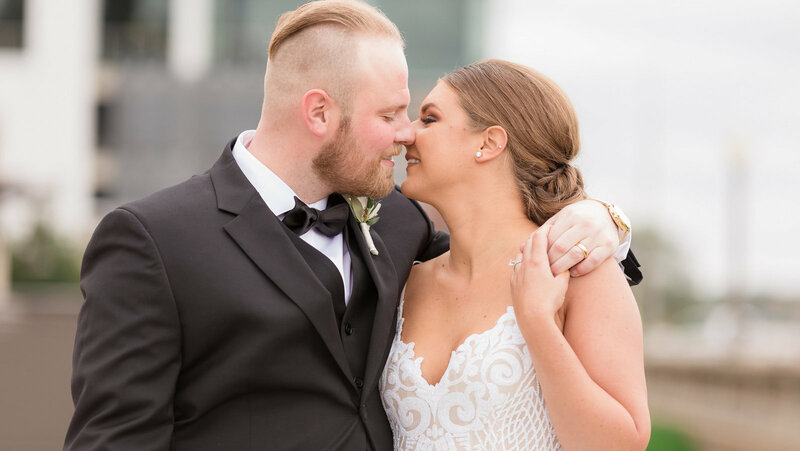 I had never photographed a couple with fireworks before–and told them that beforehand–but I did my research and ended up getting a great assist from the videographers and I love the images I was able to get! It was the most glorious day for their wedding. The sun was bright and the air was crisp without being cold. Lindsay and her ladies were getting hair and makeup done in the bridal suite at Bella Sala, while the guys relaxed in the reception hall. The waterfall outside splashed water down over the rocks, gurgling along the tiny little stream. At long last, it was their wedding day! And it was perfect. I asked what their dreams are for the future and Lindsay said, “To always be honest with one another. To always love and care for one another. To enjoy every trip, every milestone together. To have and raise beautiful, healthy, smart children of our own to love for the rest of our lives together.” I love that. I love seeing the special, beautiful bond they share. They requested doing a few quick photos at The Bluebird Diner, where they first met and it was absolutely perfect! After that, we headed straight to Iowa River Power Restaurant, where they would have their ceremony and reception dinner. It was the most perfect, glorious Wednesday afternoon! On her handkerchief, she had their names monogrammed as well as their wedding date and “Colossians 3:12-17”, which reads, “Therefore, as God’s chosen people, holy and dearly loved, clothe yourselveswith compassion, kindness, humility, gentleness and patience. Bear with each other and forgive one another if any of you has a grievance against someone. Forgive as the Lord forgave you. And over all these virtues put on love, which binds them all together in perfect unity. From the very start, their day was filled with such joy and love. Christina & Cam have exuded grace and happiness since I have first seen them together and it has made every interaction with them so much fun. When we arrived at Price Creek Event Center in Amana, it was quiet and calm. The ladies were still at the salon finishing up hair, but all of Christina’s accessories and her gown were there, just waiting to be photographed. It was the perfect way to get my creative juices flowing for the day. The weekend before had been freezing cold, incredibly windy, and rainy so I was sooo excited to have milder weather, still chilly, but not uncomfortable. These flowers were some of my favorite! So springy and pretty, while also not being too “fussy”. They were just perfect. 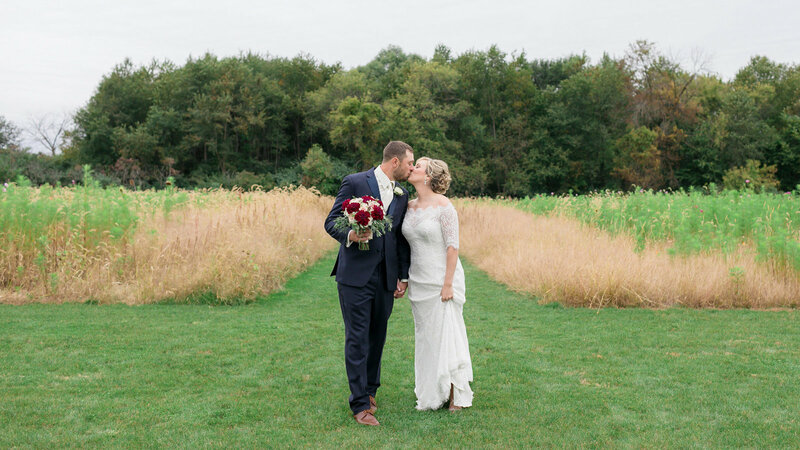 There was a grassy area outside of the venue that we used for their first look before we hopped in the car for a short drive over to an area I had scouted out beforehand that I knew would be a dream to photograph them in. 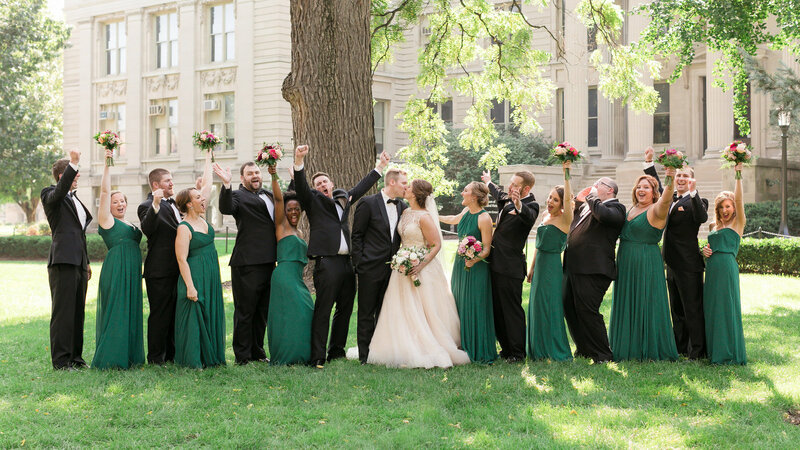 Their bridal party was such a riot! 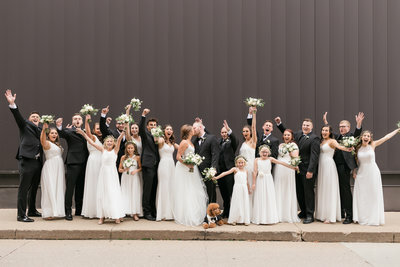 I loved photographing this crew! Look at these handsome guys! It was cloudy all day so we didn’t get a true “golden hour”, but I still think the 10 minutes of photos later on in the evening are important. It’s the chance to get away from the noise, the hugging, the congratulations, and just savor a few breaths together, alone. The sun did not shine. It was too wet to play. But with alternate plans, it was still a perfect wedding day. 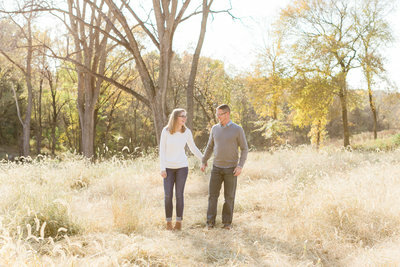 Just two days before Elizabeth & Seth’s wedding, we had sunshine and 70 degrees. But on Saturday, the wind blew so hard that the rain was going sideways. The skies were gray and the wind was biting. The plans for an outdoor ceremony were quickly scrapped and the reception space was set up to double for the ceremony as well. The staff at Rapid Creek Cidery and all the vendors pulled together to make the space the vision that they had dreamed of, despite the unwelcome weather. Seth proposed last January when they were in New York and their ongoing commitment to each other and their daughters is beautiful to witness. Beth’s students did the watercolor artwork for their paper suite. That, among so many other details, were the perfect touches to make their day personal and unique. During cocktail hour, there was a break in the rain so we dashed outside for some quick photos. These two! I’m so thankful for their trust in me and weathering (no pun intended) the elements!